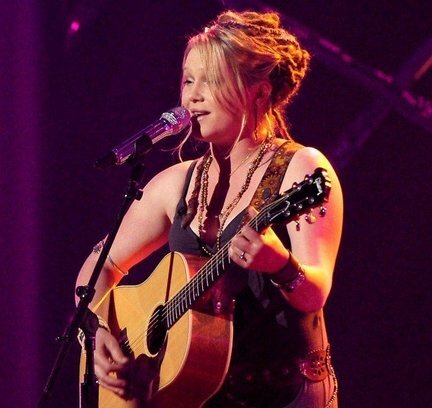 We don’t care what the critics say… when it comes to hair, Crystal Bowersox has our vote! After all, when do you see a rising star stick to her roots and wear her old hairstyle? Crystal rarely tresses up, but that might change after the American Idol finale tonight. The bluesy folk rock singer will be a success even if she comes out #2 in the biggest talent show in the country (if not the world!). Posing as a glamour girl, Crystal proves the naysayers’ wrong. The popular opinion among critics is: Crystal’s unkempt looks aren’t appropriate for Idol status. While messy dreadlocks are her thing, the daring do can easily be polished up… and it’s more versatile than you might think! Simply undo the twists and rearrange them (all up, half up, braided bun, whatever). 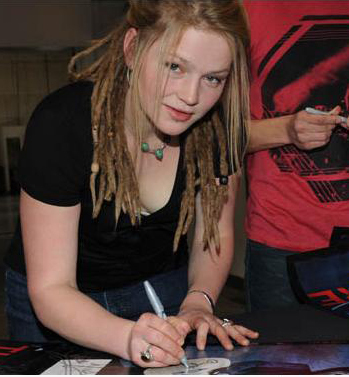 Now, this is more like it… Crystal lets her hair down when she’s offstage, signing autographs and mingling with fans. Anyone who’s never had a taste of dreadlocks (Caribbean beach style) doesn’t know what she’s missing! You can do it a little or a lot. Choose to go all out reggae, half dreadlocks or a just a few in front. Unless you’re in the islands, you probably want to play it safe. Another option: start with lots of dreadlocks and take them out a section at a time for cool crinkly curls. The best part? The twisted tresses look good for weeks or longer if you want. Simply shampoo and go… or create a one-of-a-kind coif before hitting the road! 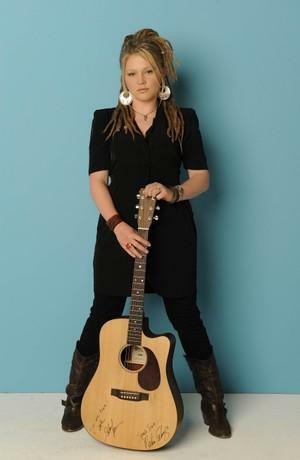 Next to co-finalist Lee DeWyze Crystal’s mane really breaks the norm until she changes it up and goes from Janis Joplin to Royal Rocker. For modern pomp, Crystal teases her long bangs and gently lifts them up and back. The rest of crown is smoothed back and topped off with a twisted ponytail. There’s a big diff between the dressy updo and the others. When Crystal strikes a “poster” pose, her hair is pretty similar to the style in the photo with Lee: the second look is tousled and pumped up on top! Yet another option is a big French-style braid wrapped around the crown and topped with calmer dreads. In a few hours the next American Idol coronation takes place… either way, Crystal wins the style competition! This entry was posted in Celebs, real hair, star hairstyles, star styles that work in real life, TV and tagged American Idol, American Idol finale, Crystal Bowersox's hairstyles, folksy/bluesy rock singer, How to dress up Crystal Bowersox's casual hairdos, How to wear dreadlocks and change them up!, Lee DeWyze, long hair. Bookmark the permalink.